I recently received an offer email from Holiday Inn Resorts Batam. 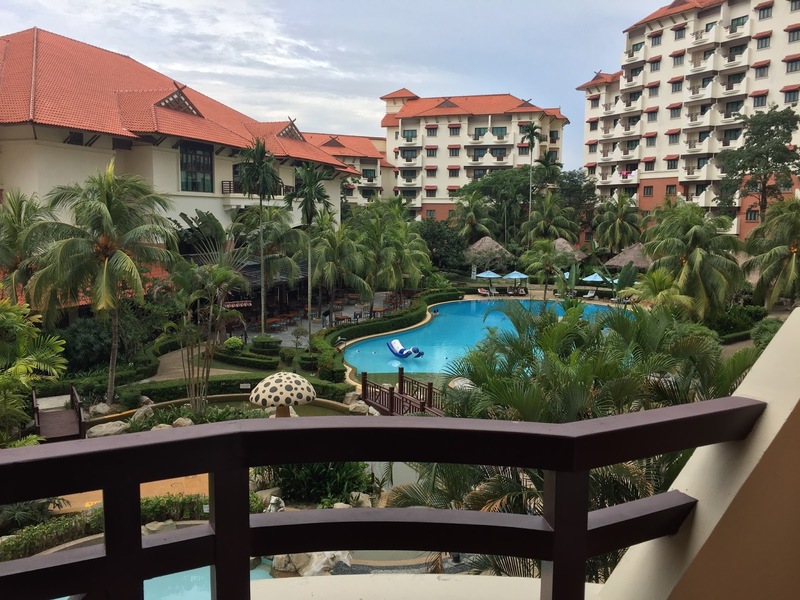 The offer is a value for money, which includes ferry tickets for 2 pax, 1 night stay in a 1 bedroom suite with breakfast for 2, a 60-min message in the Tea Tree Spa in the resort grounds and return land transfer from ferry terminal to the resort for the price of SGD240 nett. 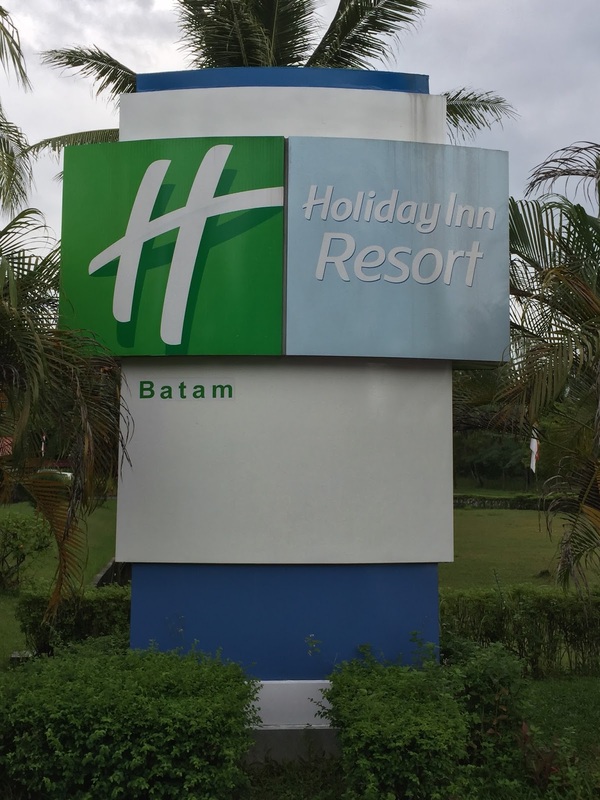 Holiday Inn Resorts Batam is located on the western part of the island, in a rather isolated part of Batam. The resort is about 30 mins drive from the shopping district of Nagoya Hill. 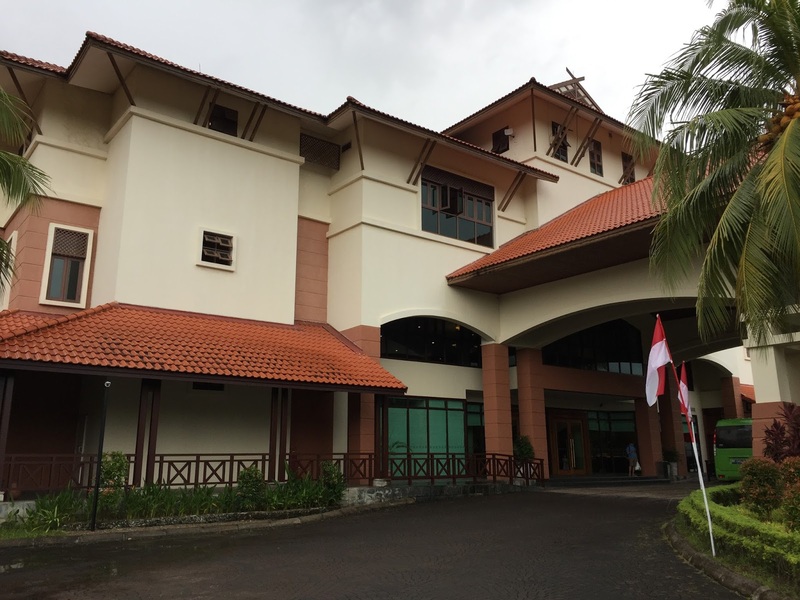 Other than Waterfront City Ferry Terminal and a sleepy town of Waterfront City, which is just opposite the resort, there are not much happening in the vicinity of Holiday Inn Batam. Patrons can forget about shopping options around the resort. 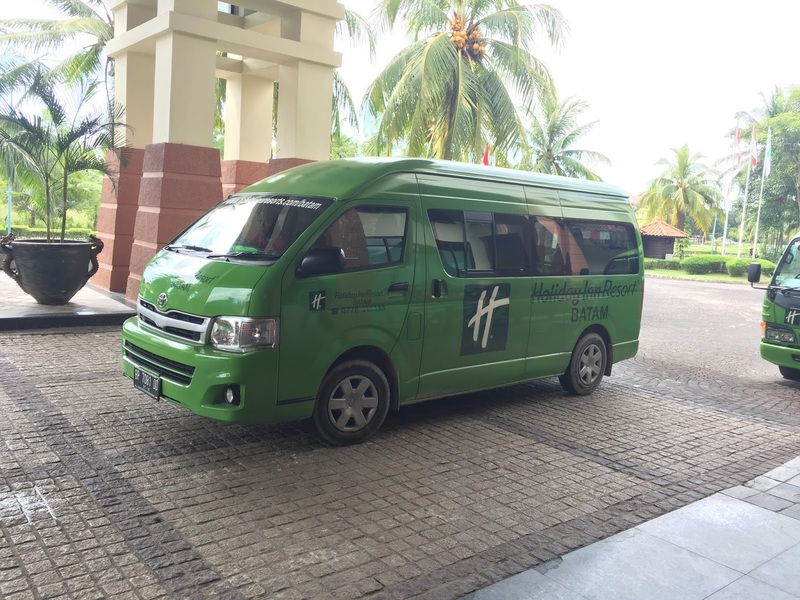 However the Holiday Inn Resort Batam provides complementary shuttle transfers to and from the resort to Nagoya Hill City from 6am till 10 pm daily. 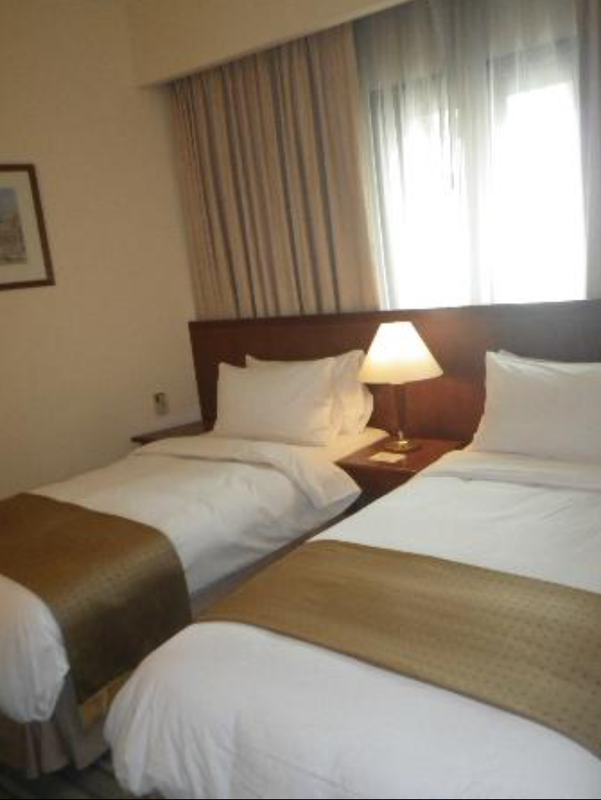 The hotel also provides regular shuttle service to the 2 nearby ferry terminals of Waterfront City and Sekupang. These shuttle services are tied to the departure timings of ferries. As I entered the 60㎡suite, I immediately entered into the dinning area. 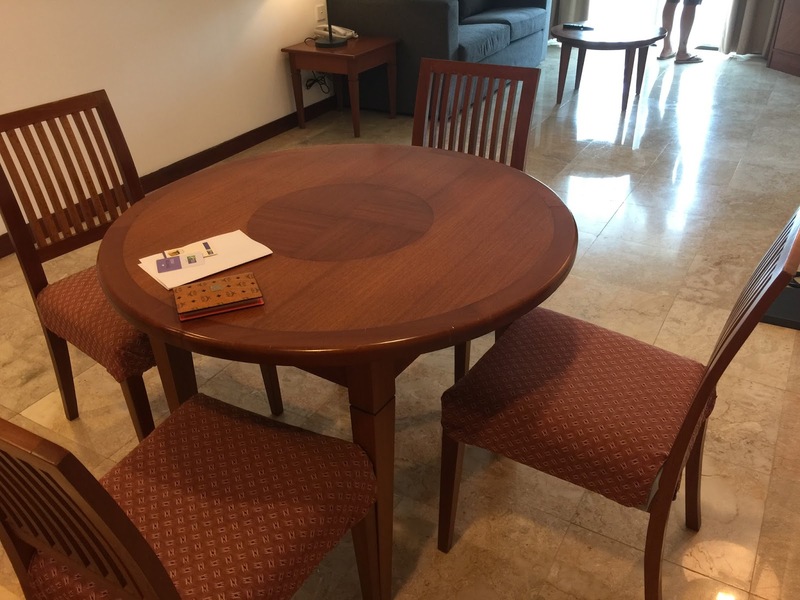 The dinning area of the suite is simply furnished with a round table with 4 chairs. A small kitchenette, built by the walls of the suite is found behind the table, next to the main entrance of the suite. 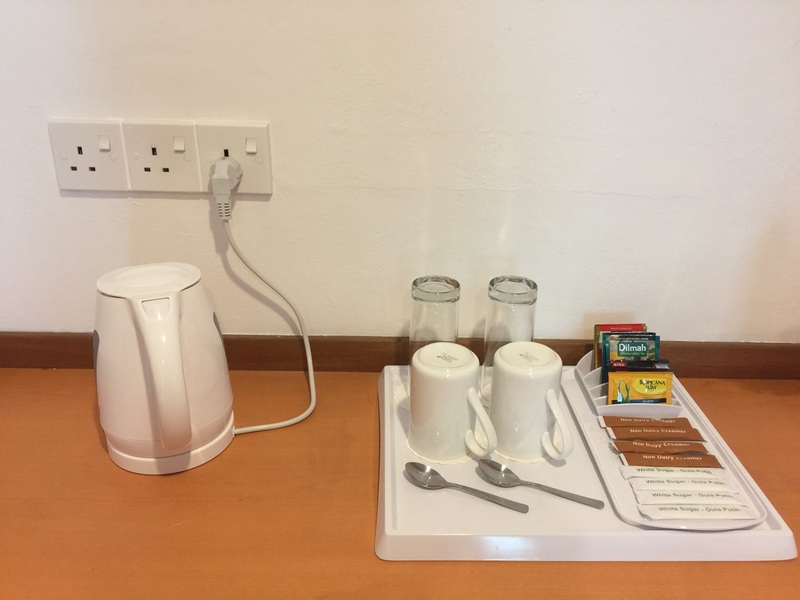 Rather than calling it a kitchenette, this area serves more like a pantry where one can find an electric kettle and a container where complementary drinks such as coffee, tea and a couple of drinking water welcomed guests. The mini fridge is well hidden inside one of the cabinets here. 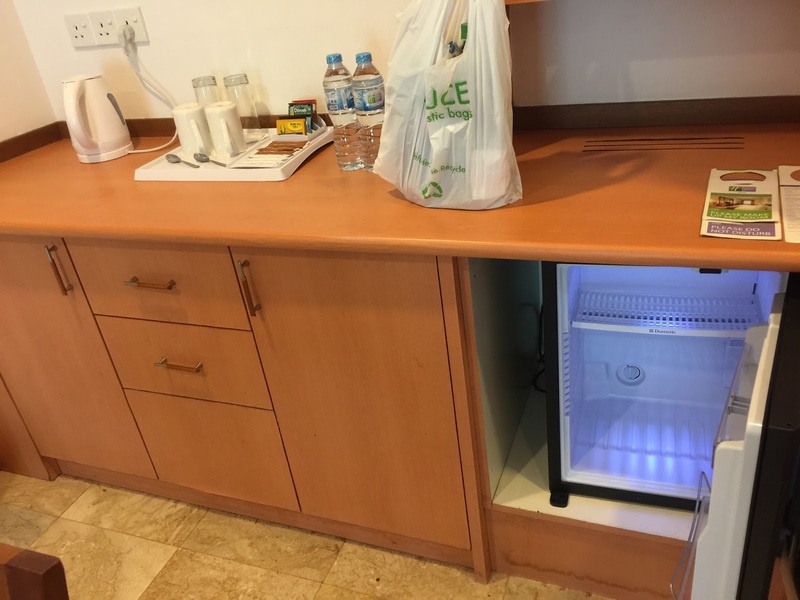 There are a number of cabinets in the pantry area, however these cabinets are empty, which makes this area seem poorly furnished. Connected to the dinning area further into the suite, is where one will land into the living area. The living area is furnished with a 2 seater couch. A coffee table is placed in front of the couch. 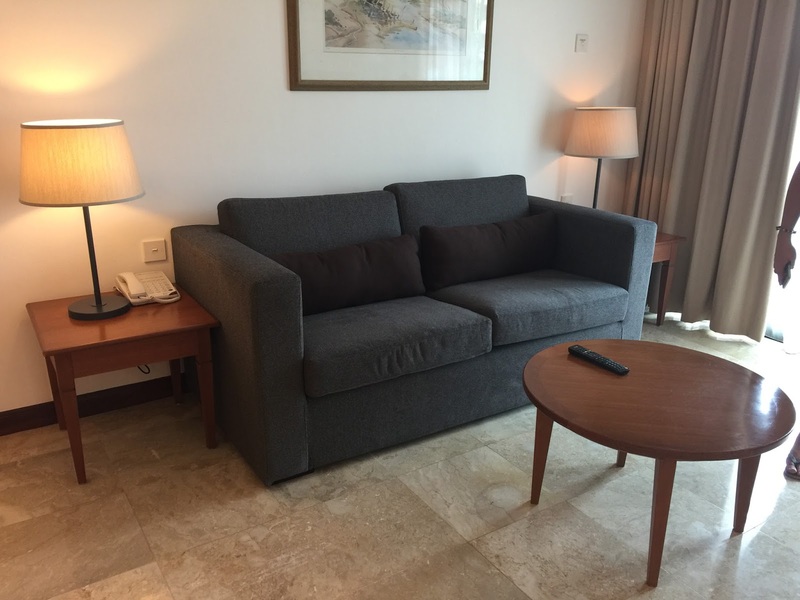 Tucked in one corner is where one can find a 32″ LCD TV placed on the TV console. There are no ceiling lightings in the living room, rather it is lighted with a couple of floor lamps, which gave me a warm and cosy feeling in the night with the lights turned on. Similar to the dinning area, the living area is furnished with very minimal number of furniture, making entertaining guests a tad difficult due to the lack of sitting area. The plus side of having only the essential furniture makes the living room look large. 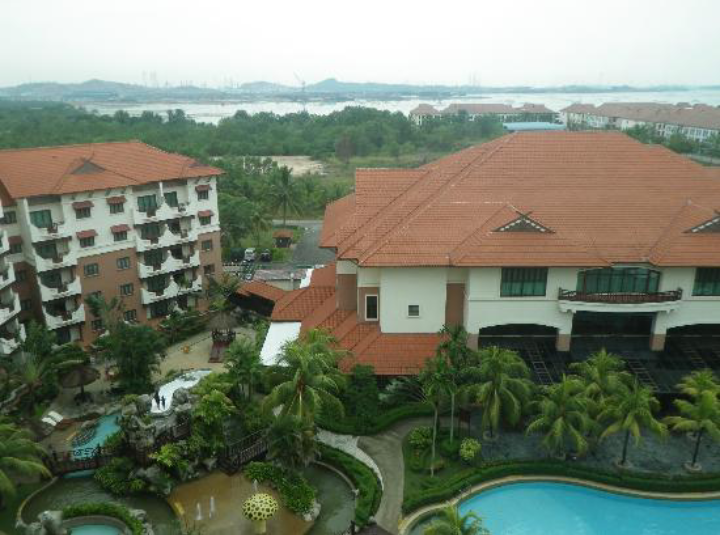 Beyond the living room is a small balcony that overlooks the main swimming pool in Holiday Inn Resort Batam. 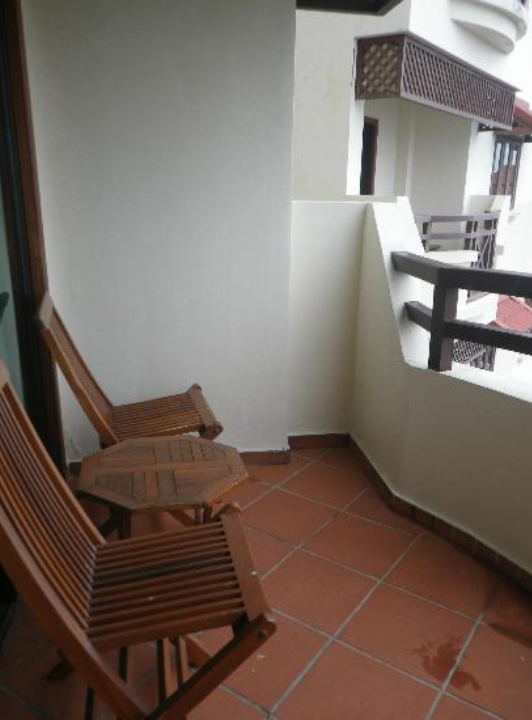 The balcony is furnished with 2 wooden chairs and a wooden table. The balcony is great place to hang out and relax. Opposite the 2-seater couch in the living room is the entrance to the bedroom. The bedroom is separated from the living room with a 2-panel sliding wooden door. Inside, the bedroom is furnished with a queen size bed, placed by the wall. A couple of bedside tables provides space for guests to place some small items onto. A dressing table is placed in one corner of the bedroom, next to the windows. 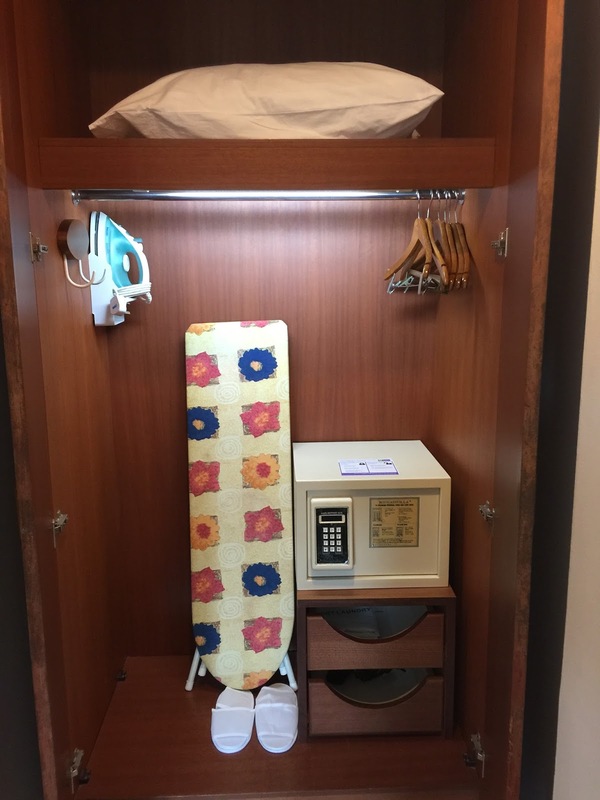 There is a small table placed next to the bed for guests to put their luggage onto. Inside the bedroom, one can find a small corridor that leads to the wardrobe. 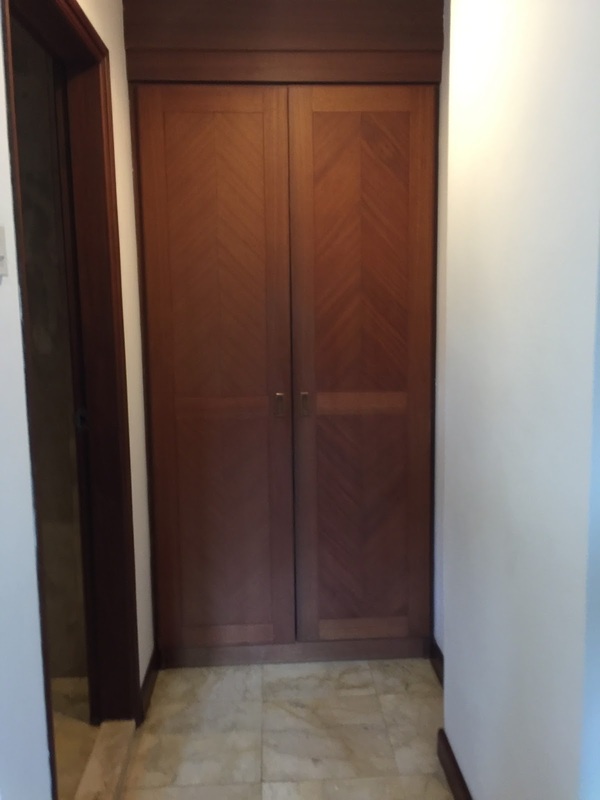 The wooden wardrobe looks worn, but still serves its intended function of allowing guests to hand their clothing onto. The suite that I stayed does not come with bathrobe. Other than places to hand clothing, an in-room safe is also found inside the wardrobe. The entrance to the bathroom is located next to the wardrobe. 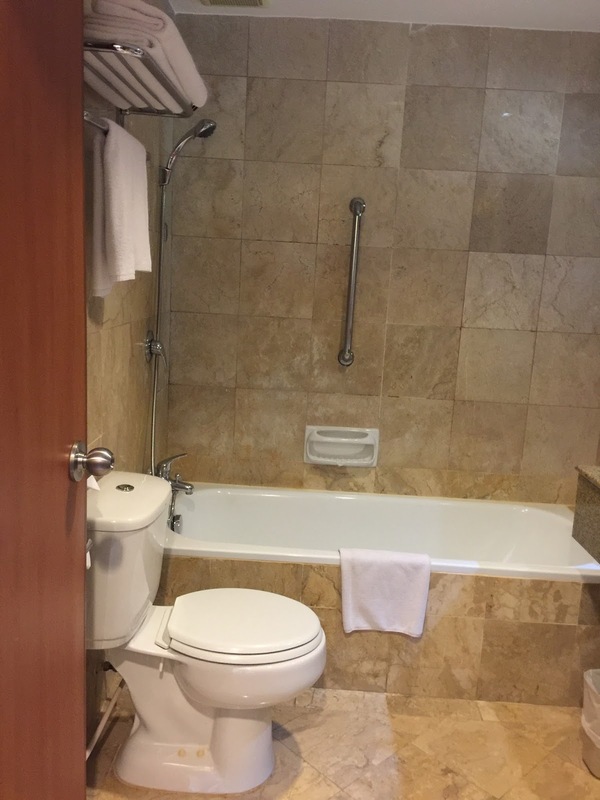 The bathroom is rather small for a suite. 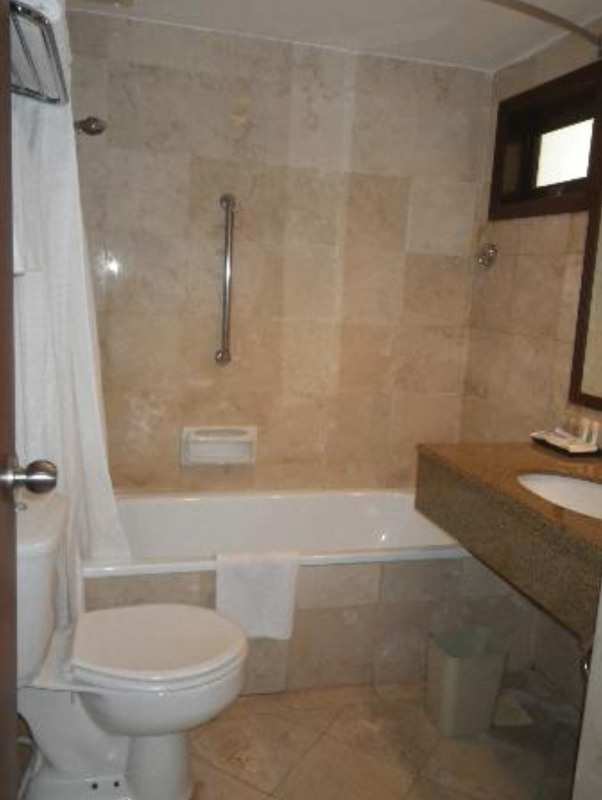 The toilet bowl seem to cramp beside the bathtub, which is also where guests would take their shower in. 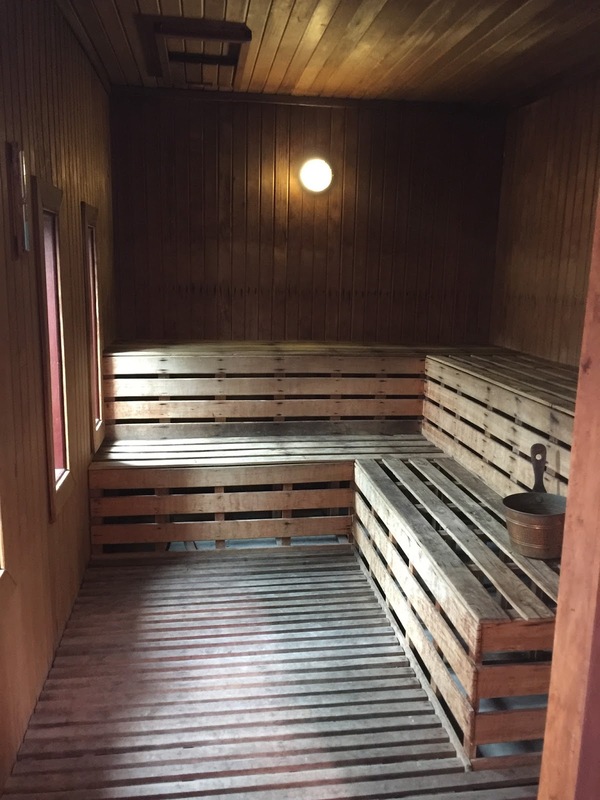 There are no separate walk-in shower stalls. Opposite the toilet bowl is where one would find the sink. 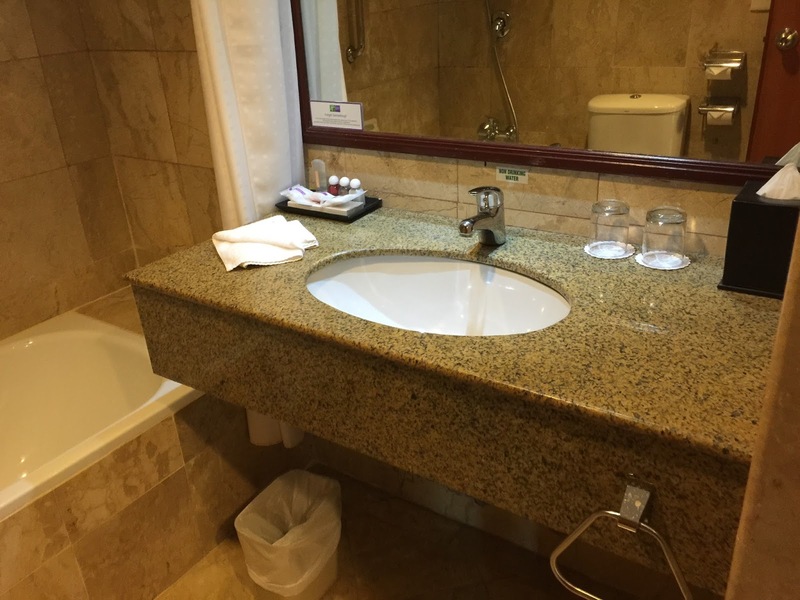 The sink area provides sufficient space for guests to stow their toiletries. There are no power sockets in the bathroom for guests to charge their shaver. The hotel seem to undergo some form of cost cutting measures. 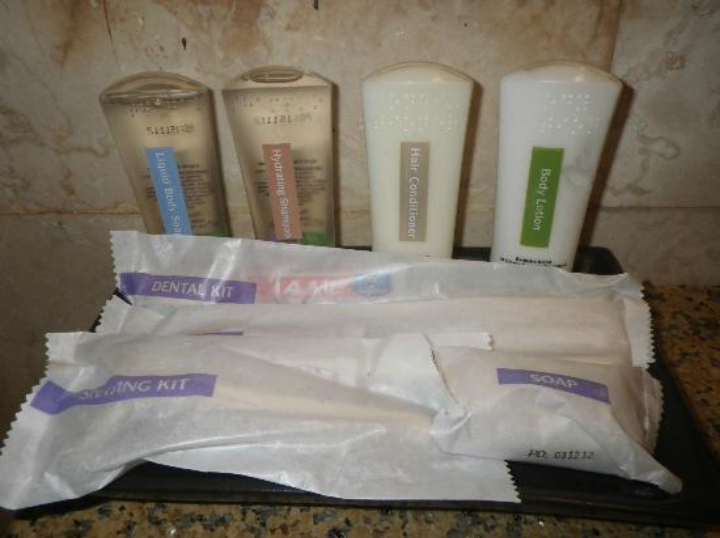 Holiday Inn uses a standard house brand toiletries throughout the world. However during my stay only a single bottle of shampoo is their house brand, the other bath amenities are not that of the Holiday Inn brand amenities. The centre piece of Holiday Inn resort is the large free form swimming pool, located in the centre of the resort. The swimming pool is a great place to get a tan or relax by. There are a number of suntan chairs by the pool for guests to tan on. 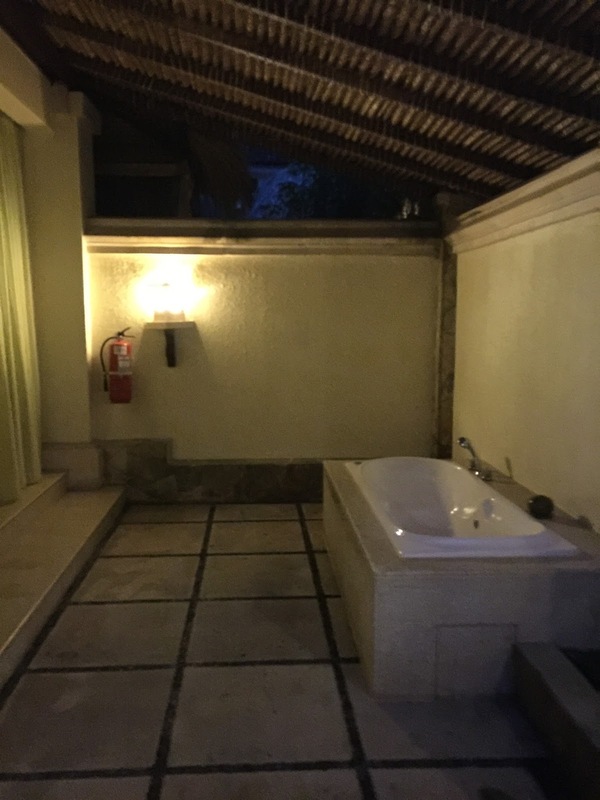 There is also a jacuzzi area by the side of the pool. Beside the swimming pool is another pool area for children. There is a slide and a small river structure to ensure young guests have a great time in. There is another lap pool in the hotel premises. 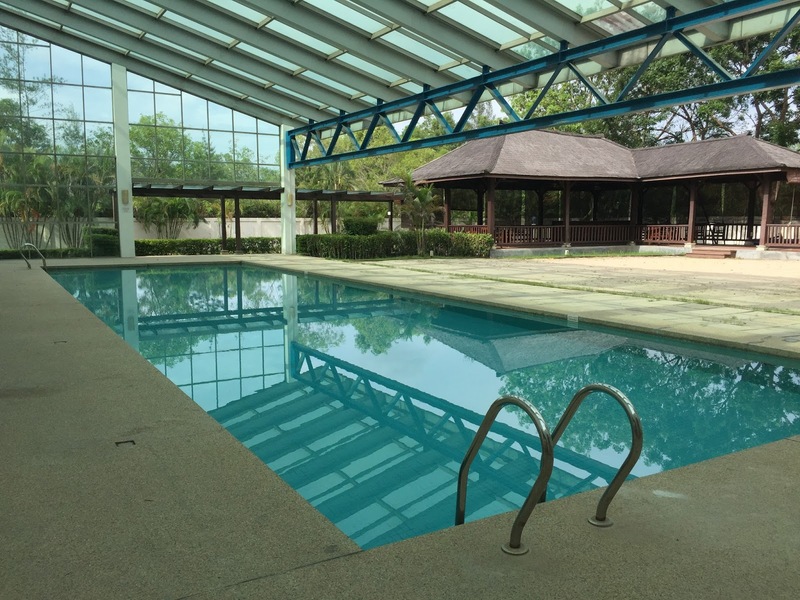 The in-door lap pool is located beside the only Chinese Restaurant, Dragon Inn in the hotel. The pool was still in good condition and is functional during my last stay. However this time round, the pool seem abandoned. Even the towel counter beside the pool is covered with a layer of dust. 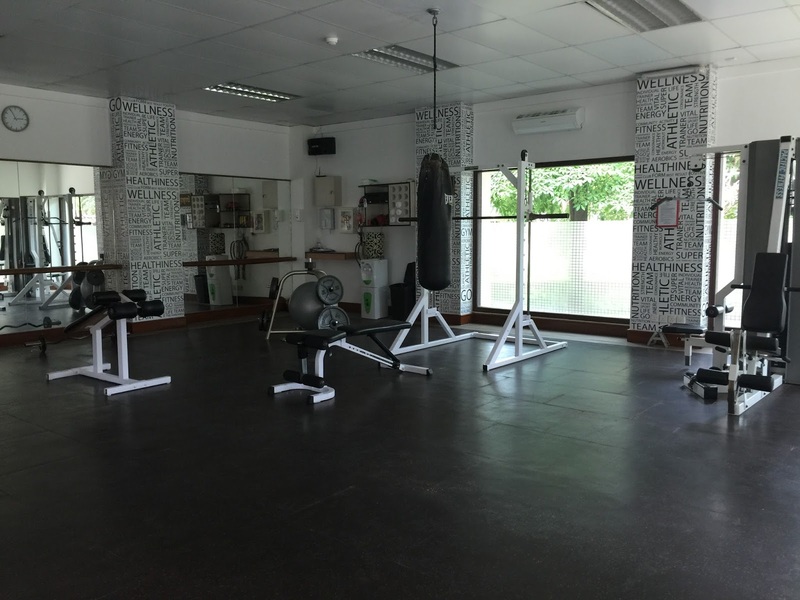 The resort has a functional gym, located behind the blocks where the rooms are. The gym occupies the entire single-level building, and is rather spacious. 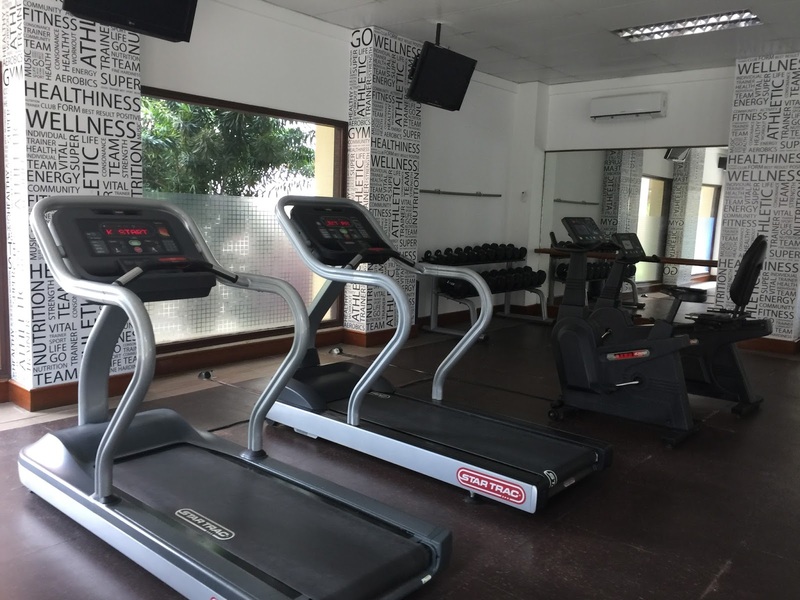 There are equipment such as treadmills and a weight machine that allows guests to get a decent, but limited workout. The equipment, however looks poorly maintained as there are rusts on the weight machine. 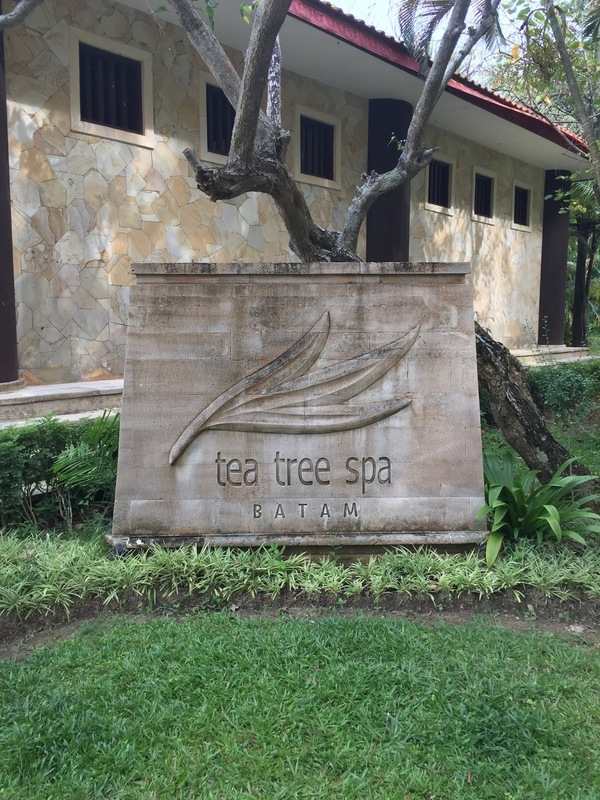 Tea Tree Spa is Holiday Inn Resort Batam’s in-house spa facilities. 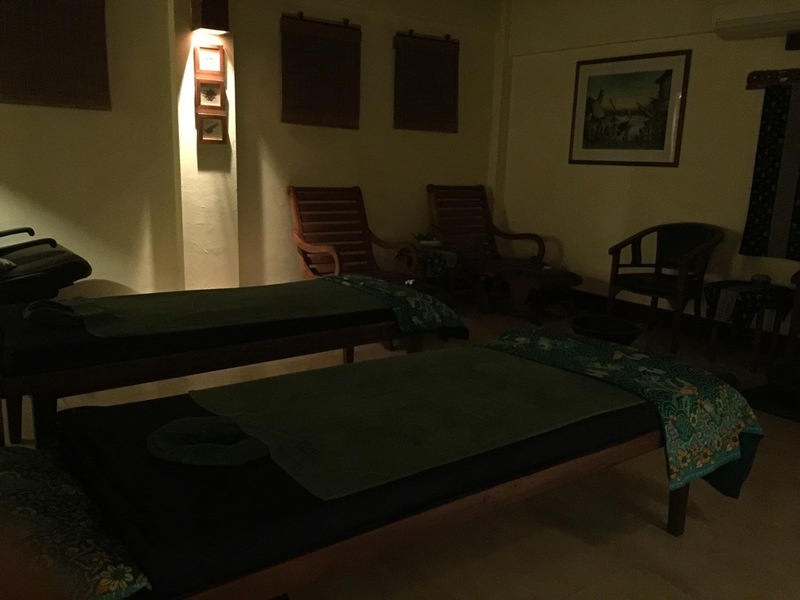 There are numerous spa villas that will be assigned to patrons who come here for a massage. 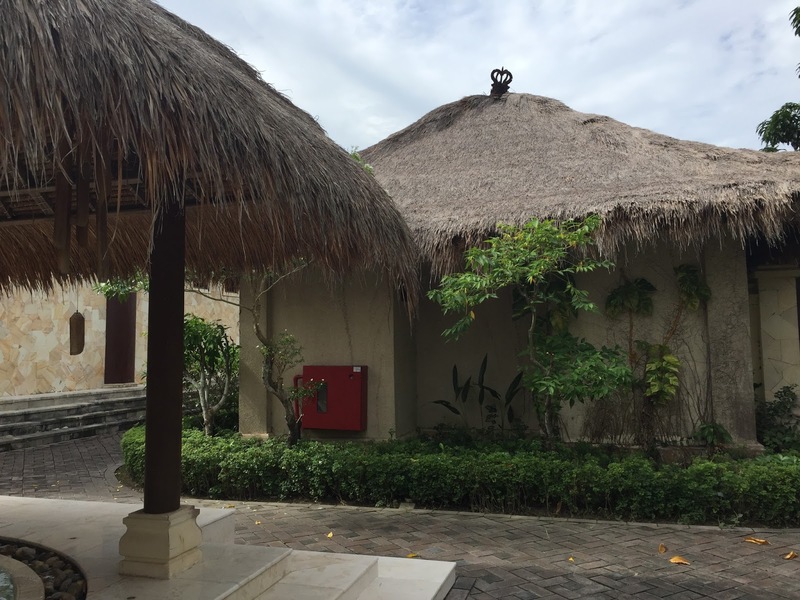 The villas have a Balinese feel to it and one will definitely feel relaxed when entering the spa premises. 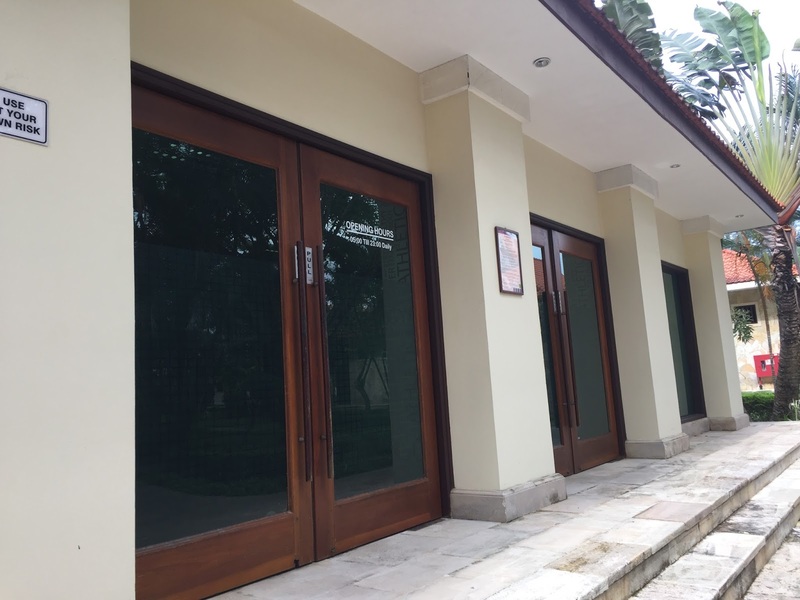 Walk pass the reception, one would come to a Balinese gateway to enter into the spa premises. 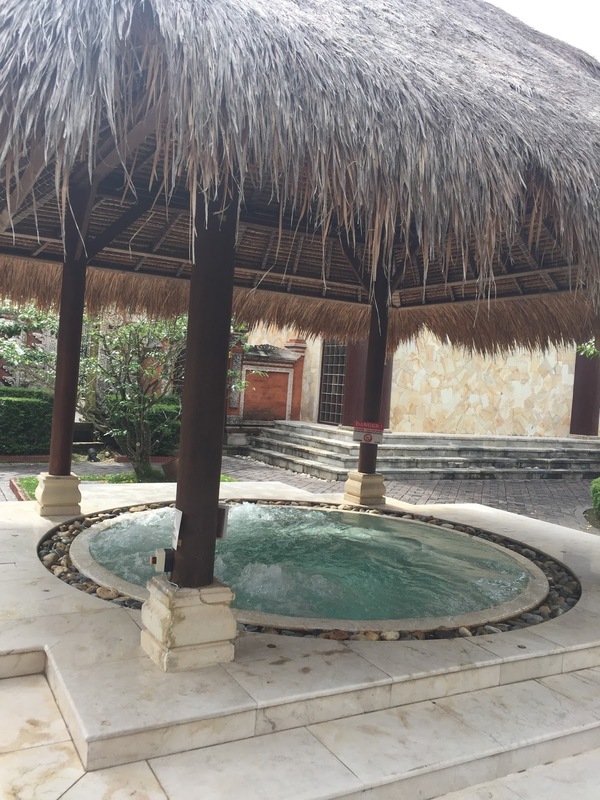 A large straw hut Jacuzzi welcomes patrons and hotel guests to soak their tired bodies away. Entering into the spa villa, one is immediately being transported to Bali, a sense of zen and tranquility plus the use of aromatherapy oil during massage, guarantees to wisp whatever fatigue one might have away. After the massage, one would be given options of ginger tea or lemongrass tea to complete the massage session. 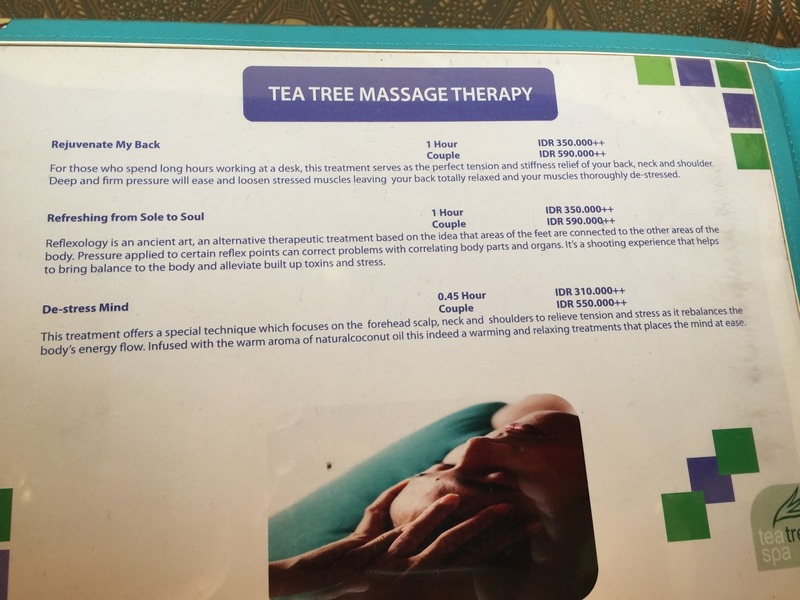 I always enjoy the top notch spa massages in Tea Tree Spa, the masseuse whom was assigned to me, though petite in size, she applied great strength when giving me the massage, while constantly asking if the strength is okay. Do come here and book your session early, as they are always fully booked. 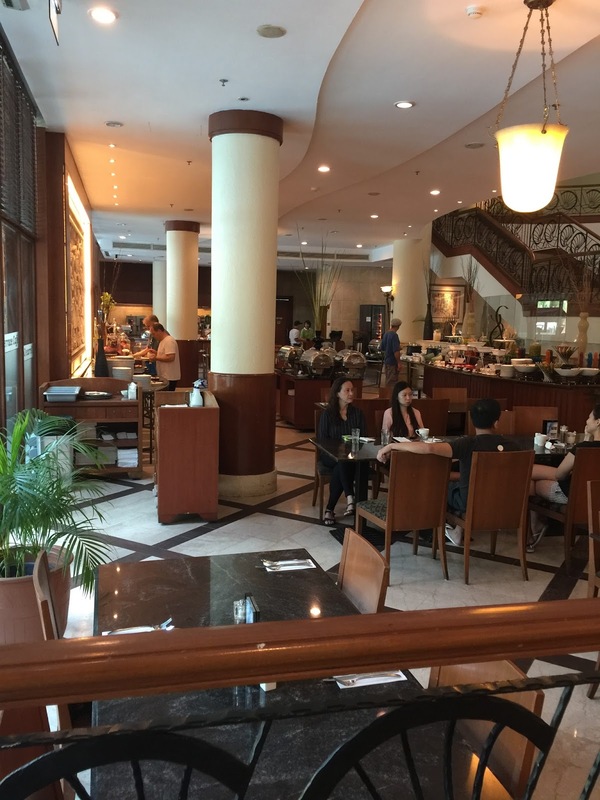 Breakfast is served at the Terrace Cafe, located on the first floor in the building where the reception is. The breakfast served is rather standard, similar to those that one can find in any other hotels. Other than the usual pastries and the continental choices, there are also some local delights. The food tasted decent and nothing impressive, although it does the job of giving me the energy to get the day going. The service in Holiday Inn Resorts Batam is exceptional. 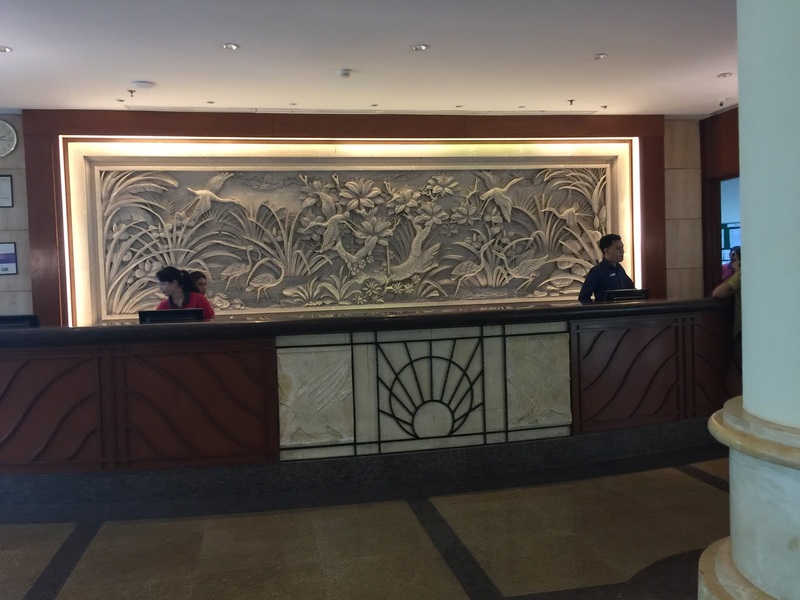 Upon our arrival, the hotel staff checked us in promptly. They took note of my IHG membership and welcomed me as a IHG member. I was given a letter that comes with the perks exclusively for IHG members staying in the hotel. However when asked if I could have a higher floor suite as stated in my preference when I booked the package, I was met with a cold answer that the hotel was fully booked, with the staff did not even appear to be checking the system to see if a suite has opened up. Other than this little incident, staffs around in the hotel are generally quite welcoming. The good service at the reception continued the next day when I was enquiring about the shuttle service to the ferry terminal. I was well advised on the timing of the shuttle that I should be catching in order for us to make it in time for our ferry back to Singapore. I called the reception from the suite when I realised that I have mistaken the timing, the staff at the other end of the line replied very politely about my need to change the timing of the shuttle and gave advise on the time I should be at the lobby to process the check-out procedures and make it in time for the shuttle. 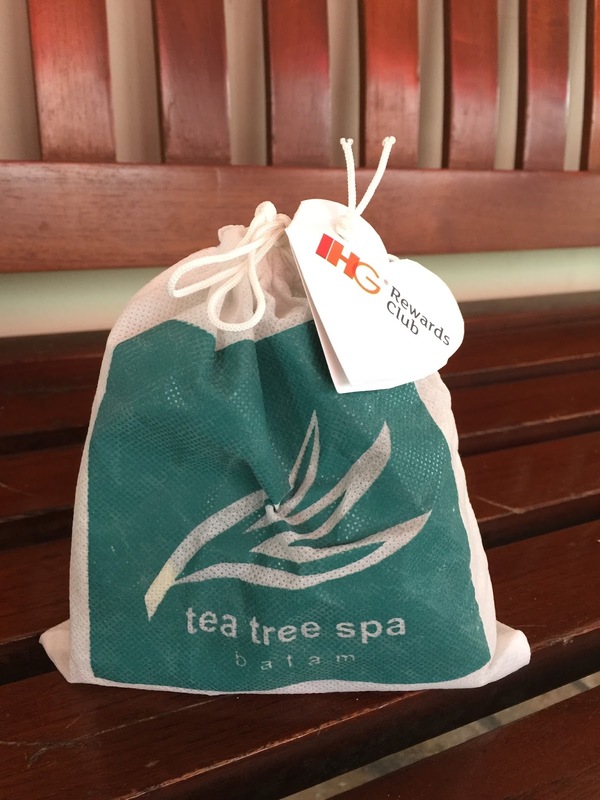 Upon check-out I was handed a small moment from the hotel with products from Tea Tree Spa in recognition of me being an IHG member. This thoughtful gesture is welcomed and goes to show that the hotel paid particular attention to IHG members. The staffs at Tea Tree Spa is forever welcoming. I was there on 2 occasions, once when booking a time slot for the complementary message and the other time for the massage. Both times the staff ensured that I was made to feel welcome and attended to me promptly. I was offered tea where the staff took prepared without letting me wait for longer than it is necessary. The masseuse at the spa was excellent, not only with their skill of massage but also with their service. They introduced themselves and welcomed us to Tea Tree Spa. Before any procedures, they would take the time to give a brief introduction of the materials being used for the massage. Every now and then, they would always check if the strength used was okay. The service at Terrace Cafe is good as well. 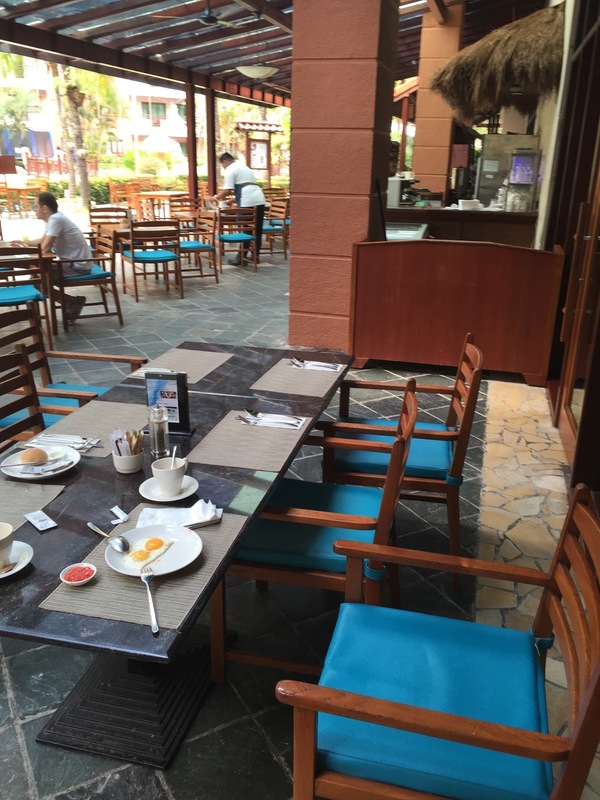 Staffs were seen clearing the plates promptly and would promptly attend to our requests while having breakfast. 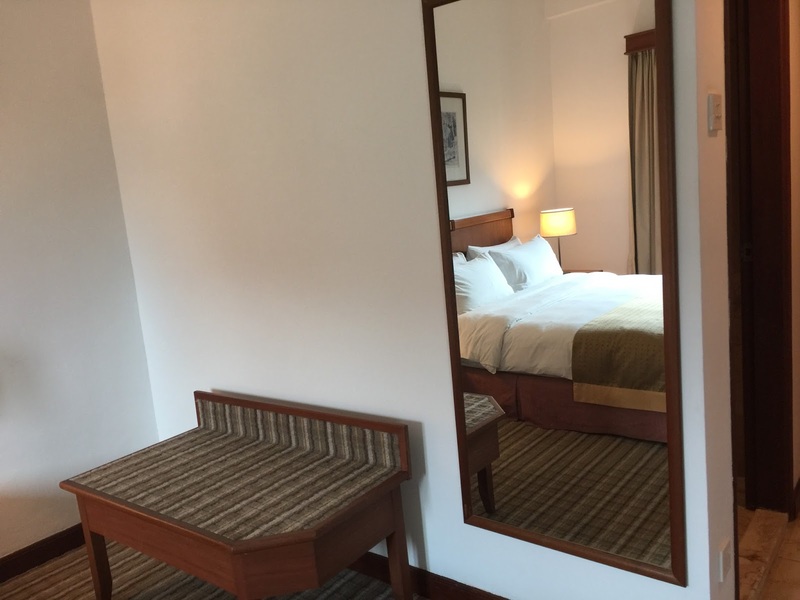 Holiday Inn Resort Batam is a great place to unwind and relax, especially so with the package that they offer through email (it is not available on their website). 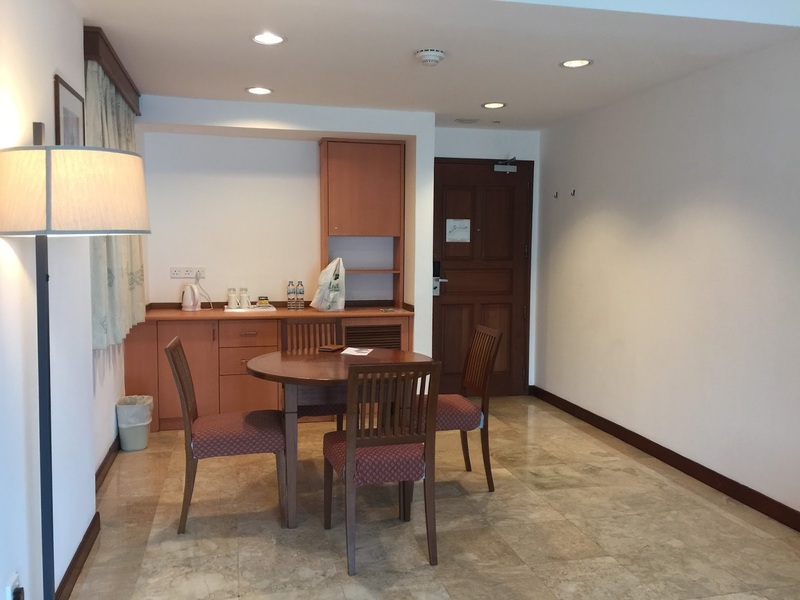 The lack of amenities outside the hotel and the distance from shopping belt in Batam did not bother me as I was expecting to stay in the resort premises throughout my stay. The suite, however feels dated and maintenance could be better, nonetheless, I had a relaxing time lazing around the suite. 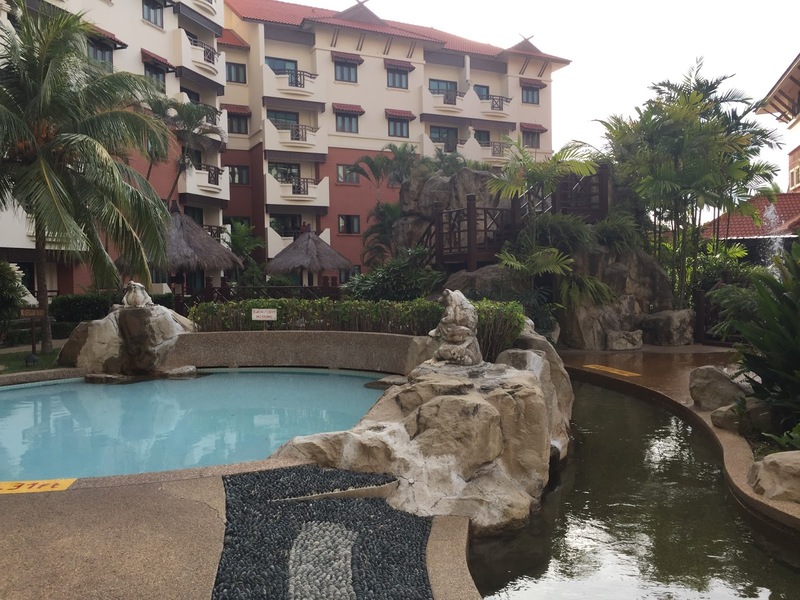 There are signs around Holiday Inn Resorts Batam that goes to show the lack of maintenance, however the main pool is well maintained. Service is good with staffs that are always welcoming and smiling at guests, even when one walks pass the reception. 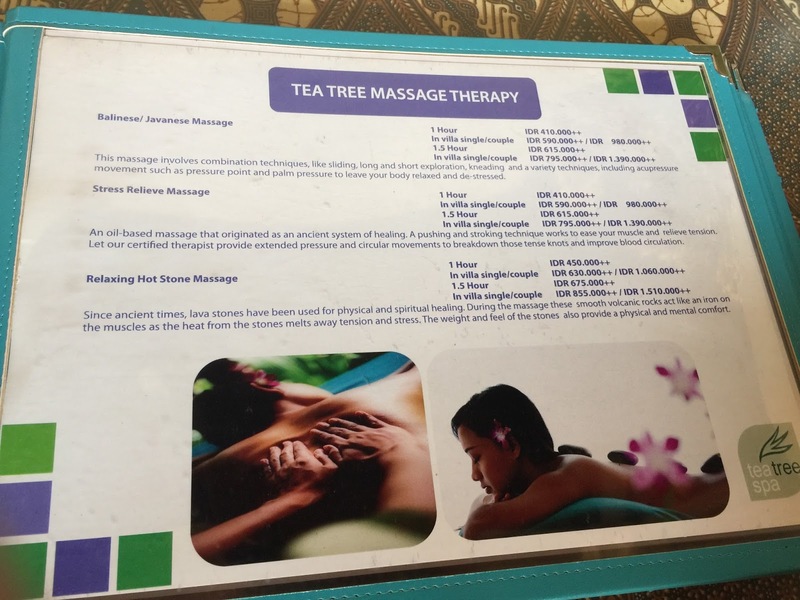 I would recommend Holiday Inn Batam for those of us who just want to stay in the resort, make use of the facilities and have a massage session with the Tea Tree Spa. 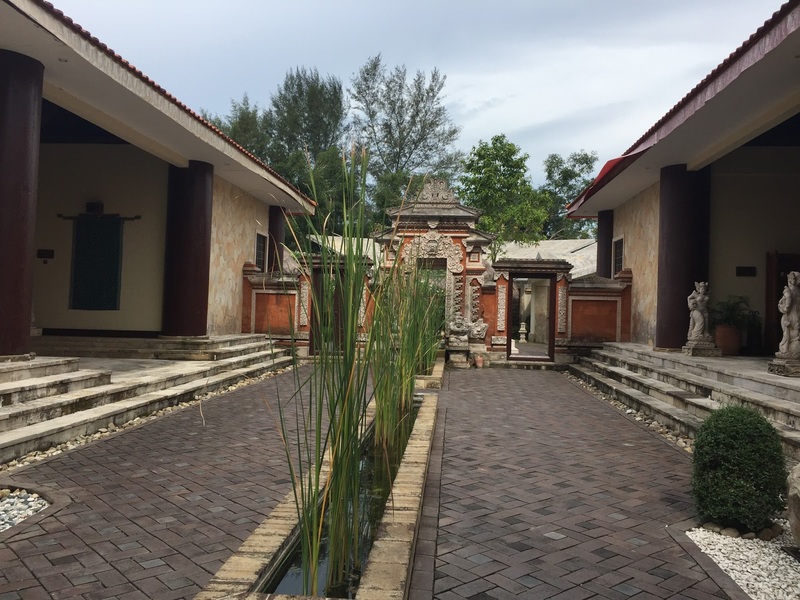 The hotel is located in an isolated part of Batam Island. It is far away from the main shopping district or the nearest decent eatery. The isolation also meant guests can totally relax in the hotel and not busy running to the nearby shopping mall. The hotel is also close to a jetty which only called upon by a couple of ferry operators. 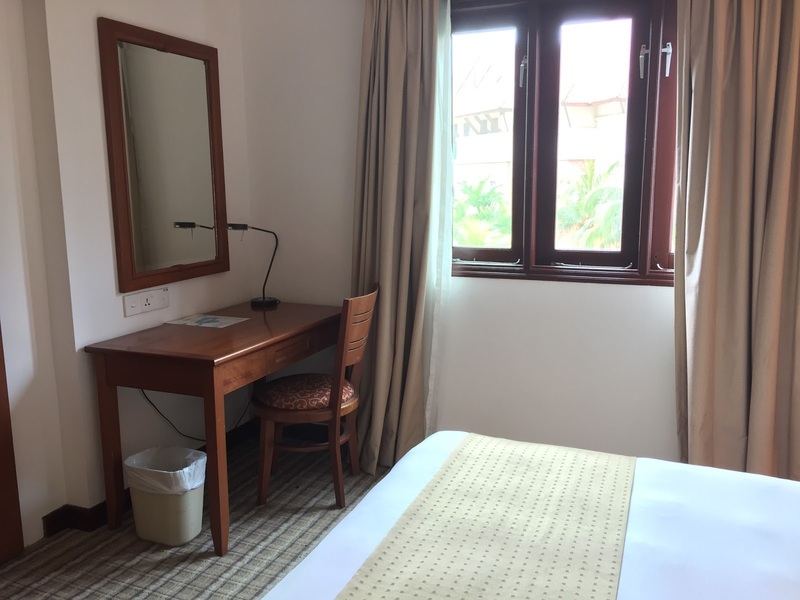 There is really nothing much around the area, this also mean that guests would have to subject to the hotel’s eateries or calling room service when one’s hunger strikes. 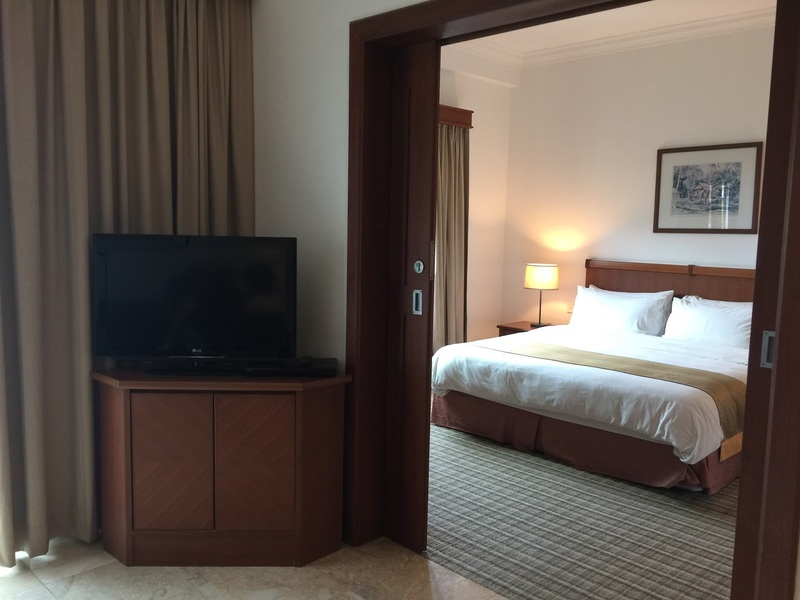 The room that we were assigned was a two-bedroom suite, upgraded from our original booking of one-bedroom suite. 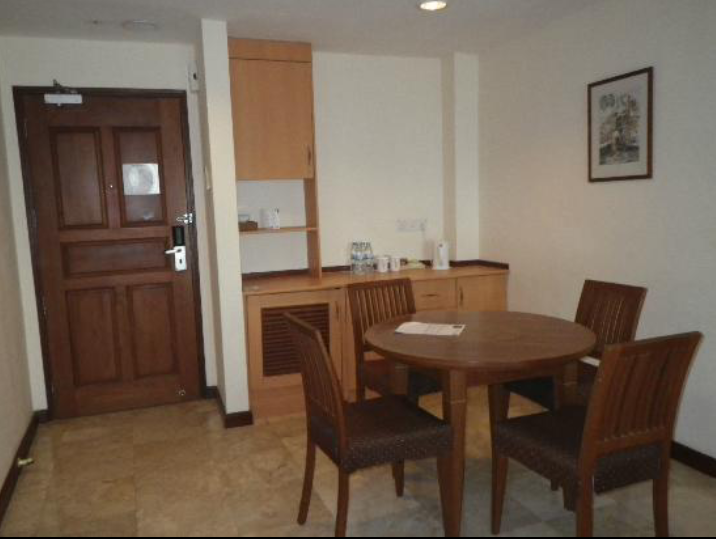 We requested for a high floor, corner room as the hotel was fully booked, we were assigned the two-bedroom suite. Upon entering the suite, a marble floored small dining area with a counter for all the food and drinks welcomed us. The dining table seats a party of four and was nicely tucked in a corner of the suite that is not obstructing. The simple designed suite signals all fixtures were there for a purpose and it is hard for one to find a piece of equipment in the suite that is redundant. The simplicity also meant that there are less clutter in the suite. Opposite the dinning table is a small bathroom which only has a toilet bowl and a standing shower. 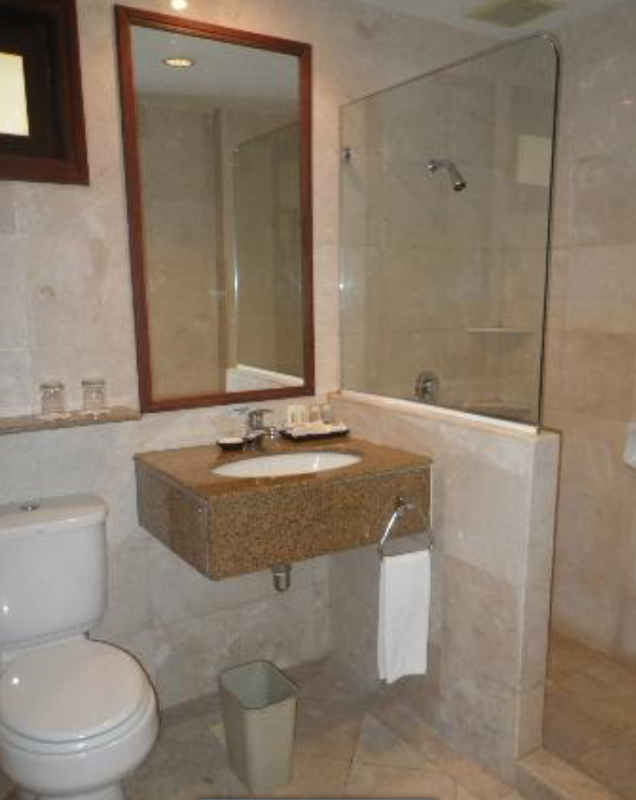 This bathroom seem to suggest it is meant for guests staying in the one of the 2 bedrooms. Further ahead into the room is the living room, featuring a 2 seater couch placed in front of the TV . The 2 seater couch is large enough to fit 3 persons. 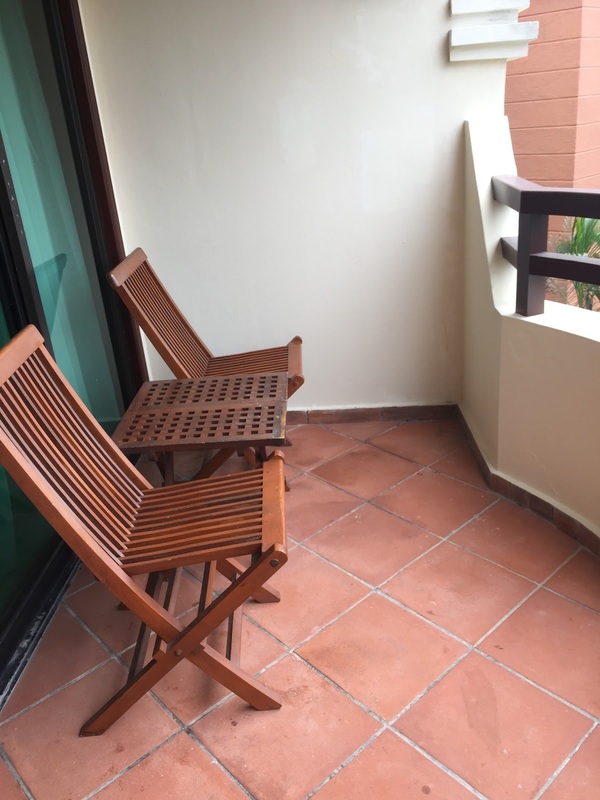 By the side of the 2 seater couch is a one seater couch facing the entrance to the balcony. The curtains are thick enough to black out the living room. There are sufficient lighting in the living room to provide sufficient illumination to the entire living room. 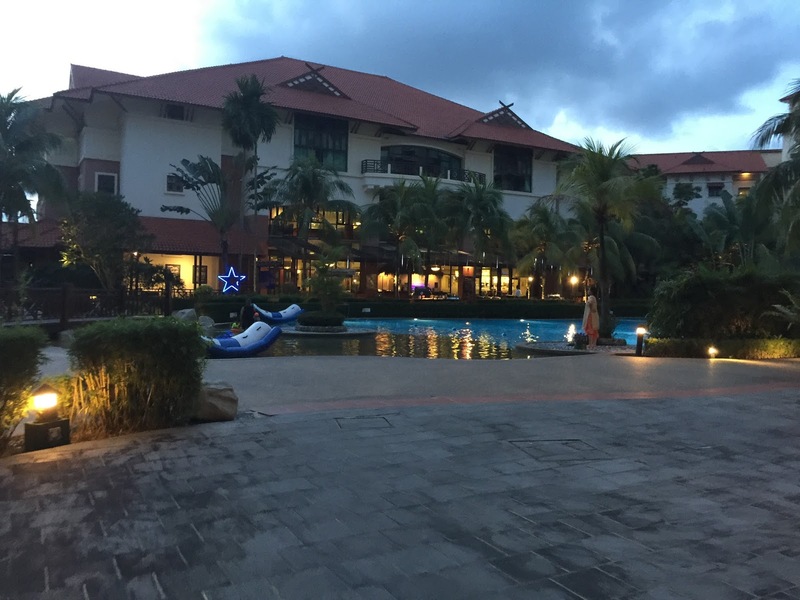 There is a small balcony with 2 deck chairs and a small side table for one to relax and relax by the sight of the fantastic swimming pool, which seemed to be the centrepiece of the entire hotel. Other then that the view is nothing to shout out for. The living room is in the centre of the 2 rooms. 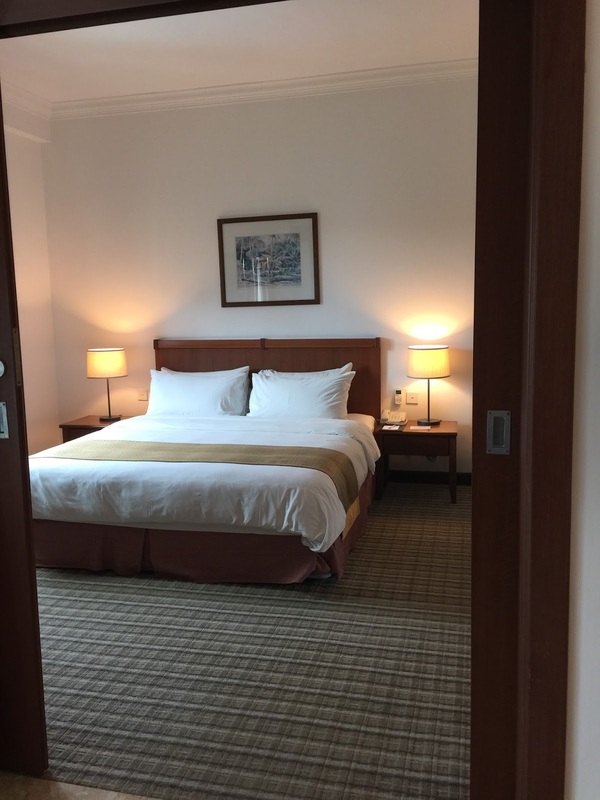 Upon entering from the main door to the suite, the room to the left features 2 single beds. There is also a small wardrobe tucked at the corner of the room. This room is rather small for a bedroom on its own. 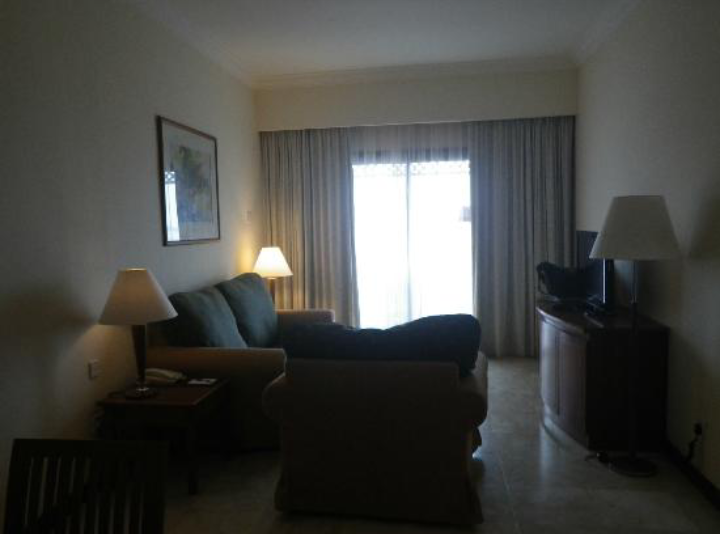 However it seemed that the hotel encourages its guests to spend more time in the living room then the bed rooms. 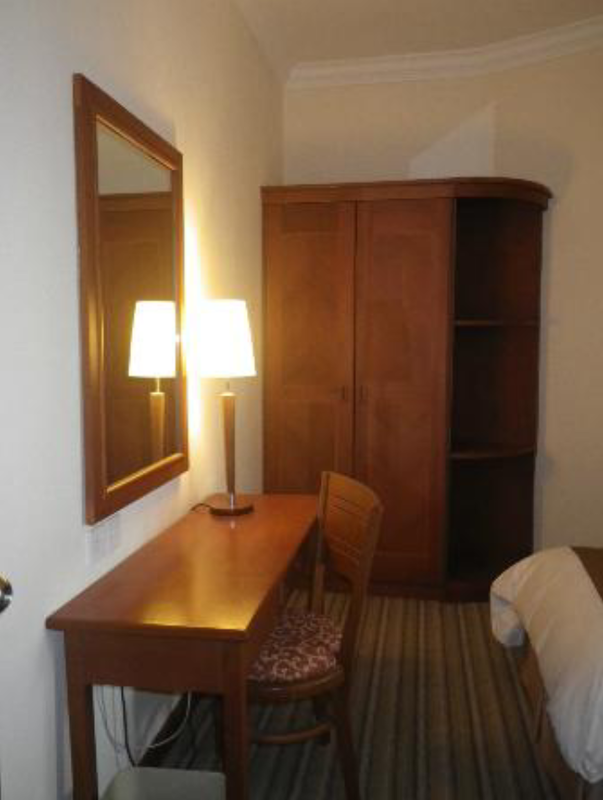 There is also a dressing table opposite the beds in this room. The decor of this room is rather minimalistic. The master bedroom is located on the right from the main entrance. This room is larger then the other room opposite it. 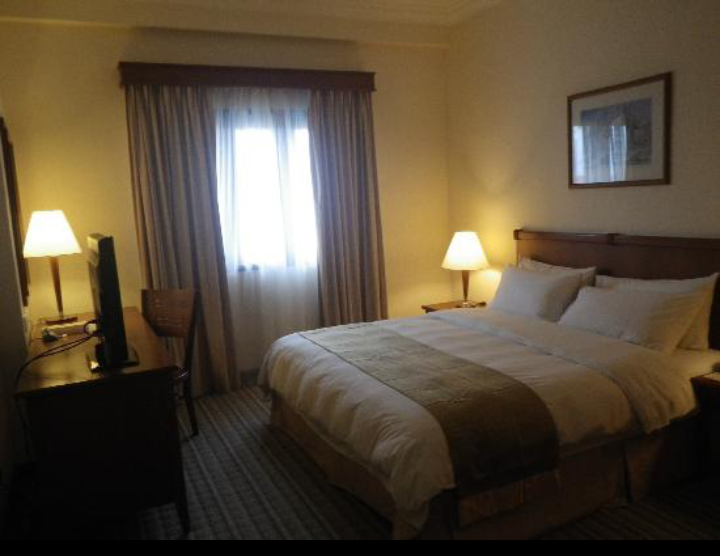 The centrepiece of this room is the queen size bed, which provided a decent sleep quality. Personally I did not sleep well in this room, mainly due to the soft and flat pillow. The decor of this room feels cozy and homely. There is another TV in this room, placed on the dressing table. There seem to be more storage space in this room as compared to the previous room. There is an attached bathroom in the master bedroom. This marble bathroom is larger then the one in the living room. There is a bathtub, which feels rather small. 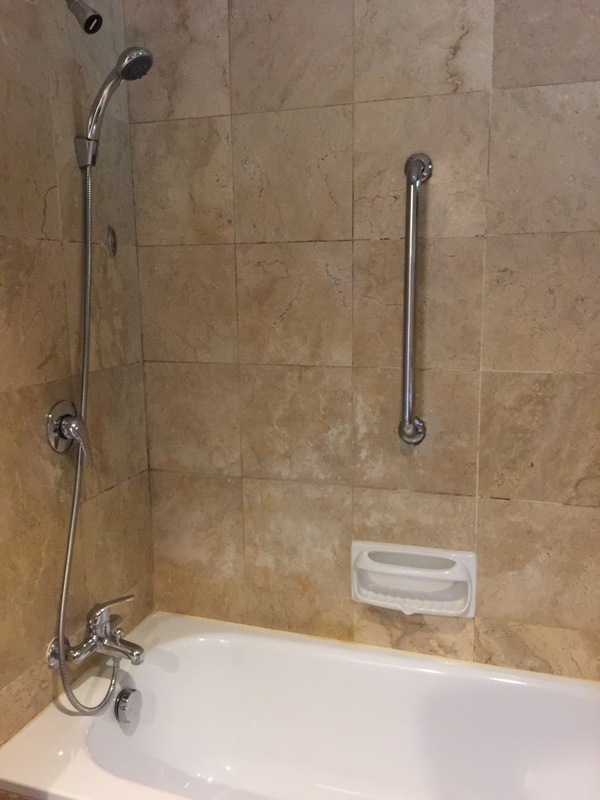 There isn’t any walk-in showers in this bathroom, the shower head is together with the bathtub. The overall decor of this suite feels dated from the living room to the bedrooms and to the 2 bathrooms. The overall service rendered by the staff in this hotel is fantastic. They were always spotted smiling and were very attentive to guests. We were served with cold drinks upon arrival, while waiting for our turn to check in. The attentive staff even recognised me to be a member of the hotel chain and accorded me member privilege without even producing my membership card. The staff at the reception apologised immediately for our waiting due to her checking in another guest before us. As mentioned earlier on, I had put down my request for high floor and corner room into the system when I booked the stay, without me mentioning it, the staff processing our check in apologised for not having the room that I requested ready due to high occupancy rate. She refused to let us wait till 2pm and gave us complementary upgrade to the location of the room I requested without even me asking. The staff at the Tea Tree spa was great. They are welcoming and did provide excellent service in their massage. I was frequently asked how’s the strength of the massage and is the massage ok during and after the spa session. My only complaint is the staffs from the main restaurant in the hotel. I was by the pool and tried to wave for someone to send the menu over, it took me around 30 mins to get some attention. More can be done by the staff here to be attentive to their guests. The stay at Holiday Inn Batam was fantastic. Despite the aged suite and the poor sleep quality due to the pillows. Majority of the staffs here displayed exemplary service standards. This is a place to be should one wants a relaxing time without the mad rush of shopping. The air conditioning in the suite was great and managed to cool down the suite in a short period of time.